When you work with Realtor Shawn Buryska, you’ll be buying or selling a home with the top real estate agent in Rochester, Minnesota. There are other Rochester Realtors, but Shawn has the credentials for the designation of a top agent and the experience to make the process as easy as possible for you. Indeed, every year between 2003 and 2012, he was the highest-selling Realtor within the Southeast Minnesota Association of Realtors (SEMAR). Coldwell Banker named Shawn the #1 Realtor in Rochester in 1996, 1997, 2000, 2001, 2002, 2003, 2004, 2005, 2006, 2007, 2009, 2010, 2011, and 2012. In 2003, SEMAR voted him Realtor of the Year. In 2008, Shawn ranked ninth nationally — out of more than 59,000 Coldwell Banker real estate agents — in the category of homes sold. And in 2012, Shawn ranked fifth out of 2,900 Coldwell Banker Burnet agents in Minnesota and Wisconsin in terms of listings sold and sales units. When you get to know Shawn, it’s easy to see how he became Rochester’s real estate champion. He’s extremely knowledgeable, and has a long list of delighted clients. Shawn can stage a home inside and out so that it looks its absolute best. And he’s willing to assist his customers with complicated paperwork. In addition, Shawn is renowned for his ethics and planning skills, and he always has the support of his expert staff members. Moreover, he’ll make sure that your transaction is swift, smooth, and efficient, and he will personally verify that every detail of your deal is handled properly. In short, he is as consistent, committed, responsive, enthusiastic, and dependable as anyone in the profession. 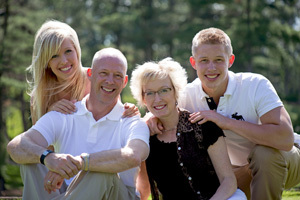 Shawn’s path real estate success began in Owatonna, Minn., where he was born in 1963. He moved to Rochester four years later, and he’s lived in the community ever since. Shawn originally set out to become a mechanical engineer and even studied engineering at Rochester Community College. But he had an epiphany as a college student: He landed a part-time job that involved selling health club memberships, and he realized that he was a natural salesperson. The idea of selling homes soon became a livelihood he pursued with dedication and vigor. In 1986, the state of Minnesota granted him a real estate license, and he began to fulfill his calling. Today, Shawn Buryska is a devoted husband, father of two, fisherman, hunter, skier, sailor, and carpenter. However, whether he’s hitting the slopes or relaxing on a lake, you can be certain that the challenges and joys of real estate are never too far from his mind. If you’re interested in buying a new home or selling your old home in Rochester MN, make the process easier by contacting top Realtor Shawn Buryska at (507) 252-6745 or via email at SBuryska@CBBurnet.com.